Remember that Whole30 Mexican Braised Beef with Sweet Potato? Remember how I told you to make enough for leftovers? I really hope you did so that you can make this epic Braised Beef Breakfast Skillet! 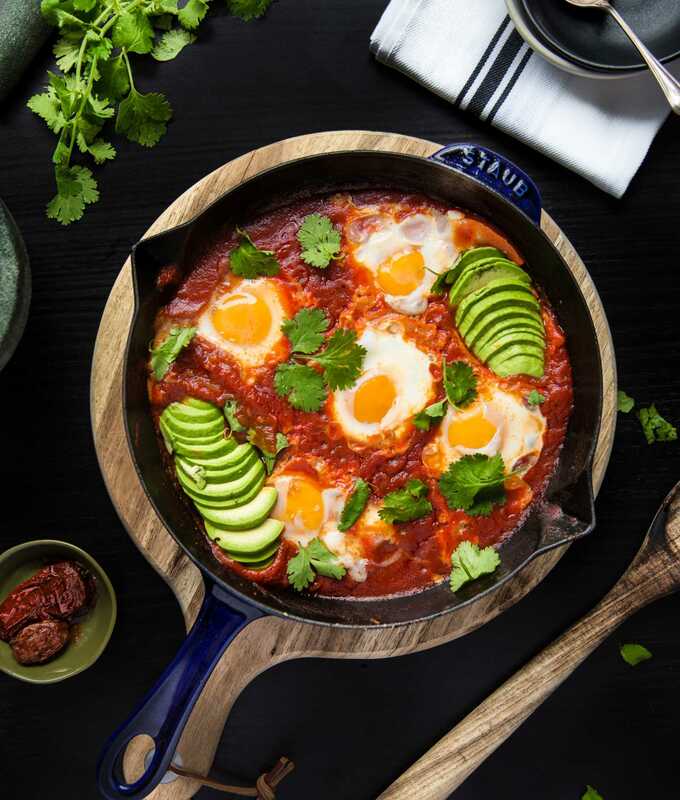 This skillet is an elevated riff on a Huevos Rancheros. Instead of salsa, however, I use the leftover braised beef as a bed to poach the eggs directly in. Everything gets topped with heaping spoonfuls of quick-and-easy Pico de Gallo that helps awaken all of the deep and delicious flavours in the meat. Though I am a big fan of spicy foods, I would suggest making the Pico de Gallo on the mild side because the beef should be spicy enough from all of the whole chilies you used the day before. 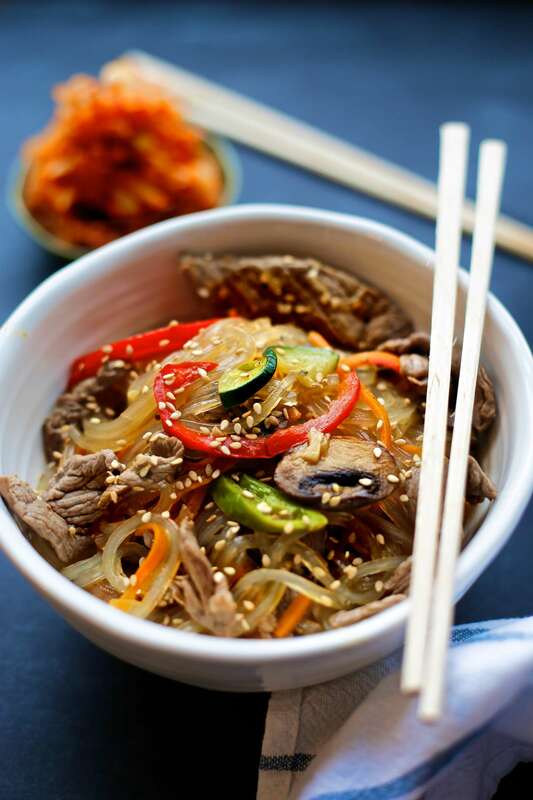 Then again, go crazy and make it as spicy as you want. Who am I to tell you otherwise? 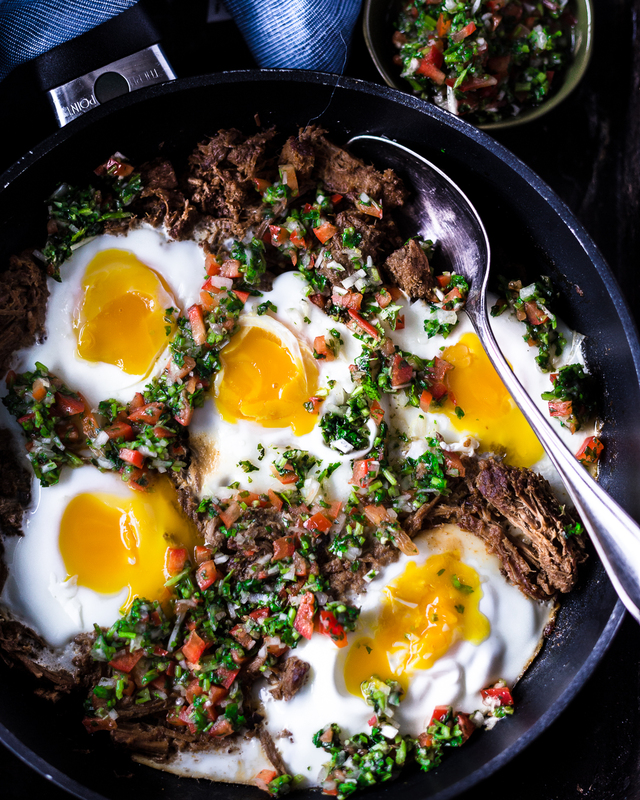 Essentially, this Braised Beef Breakfast Skillet is a Mexican take on Shakshuka, which is by far what I am best known for (see YouTube video with nearly 1M views!). 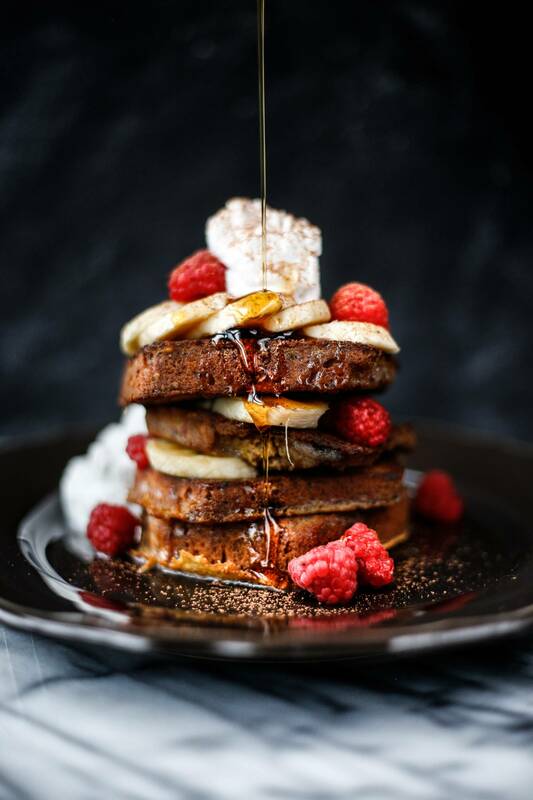 I should also mention that you can use just about any skillet to make this beautiful breakfast. Ballarini recently sent me a few of their pans to test out and they are great! Pictured is the Rialto model (available here: http://amzn.to/2nabkKo) which features the Thermo-Point on the handle. When the pan is hot the green dot turns red and lets you know it’s time to get cooking! You may recognize their other pans from a recent giveaway I hosted (see here for a great Chicken Stir-Fry recipe and more images of Ballarini’s other models). toss all ingredients together in a mixing bowl – set aside. Add leftover Mexican Braised Beef and water to a skillet over medium heat and cover with a lid. Bring to a gentle simmer. Spoon pico de gallo overtop of the skillet and serve. *This post was not sponsored by Ballarini nor did they have any influence over the content herein. They did, however, give me this pan for free. In the spirit of full-disclosure, this blog post contains affiliate links that provide it’s author with a small commission. You can help support Primal Gourmet by purchasing items through the links provided.